Ba é William "Bill" Jefferson Clinton (William Jefferson Blythe III, ar 19 Lúnasa, 1946 a rugadh é) an 42ú Uachtarán na Stát Aontaithe Mheiriceá sa tréimhse 1993 go dtí 2001. Deirtear gur thuig Clinton go raibh sé ag iarraidh a bheith ina pholaiteoir tar éis óráid Bernadette Devlin a chloisteáil sa bhliain 1969. Roimh bheith ina Uachtarán dó, chaith sé cúig sheal mar Ghobharnóir Arkansas (1978-1992). Sa bhliain 1998, bhí sé líomhnaithe go raibh caidreamh gnéis ag Bill Clinton le hintéirneach an Tigh Bháin, Monica Lewinsky.. Chruthaigh an scannal deacrachtaí don rialtas. Ar an 17 Lúnasa 1998, d'admhaigh Bill Clinton go raibh caidreamh aige le Monica Lewinsky, a bhí ag obair sa White House sna blianta 1995-1996. Ar an 21 Meán Fómhair 1998, foilsíodh fianaise Bill Clinton maidir lena chaidreamh le Monica Lewinsky. 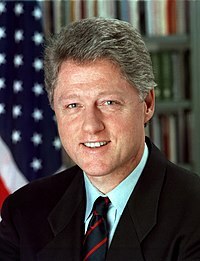 Ar an 4 Márta 1999, chuaigh leabhar a scríobh Monica Lewinsky faoina caidrimh le Bill Clinton ar díol. Bhí an leabhar ina shiocair scannail agus tharraing se náire ar Clinton. Chroith an scannal muinín san uachtarán Tháinig an freasúra i dtír go mór ar an scannal. Ach ina ainneoin sin, d'fhan Clinton in oifig go dtí deireadh a théarma. Tugadh an leathanach seo cothrom le dáta an 4 Márta 2019 ag 21:26.